Have you ever noticed a field with streaks of white accents in amongst topsoil in unproductive areas? Those trouble spots are most likely due to excess salinity aka salt build-ups in the soil profile. Saline soils cause major problems for farmers as they halt the movement of water, preventing uptake by crops, making production non-existent. 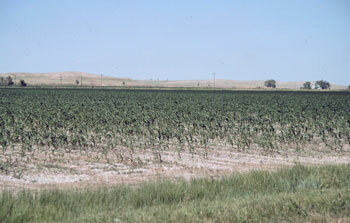 To help farmers mitigate this growing problem, the South Dakota Corn Utilization Council has been working with South Dakota State University on a three-year study to find possible amendments that would alleviate salinity issues, making that ground once again productive. As the second year comes to a close, researchers from South Dakota State University’s Plant Science department will host a Saline and Sodic Soil Management Workshop and Field Tour for growers who would like to learn more about this issue. The workshop will take place on Tuesday, July 8th in Pierpont, South Dakota with registration beginning at 9:30am. Morning speakers will include SDSU’s Cheryl Reese, Gregg Carlson, Doug Malo and Rachel Owen who will discuss the study’s background, objectives, results and management options. White Lake farmer David Gillen, who has taken part in the study, will be talking about getting a return on investment in high salt soils. The National Resource Conservation Service’s Jason Miller and Andrew Oxford will be performing a rainfall demonstration with saline/sodic soils. Lunch will be provided by the SD Wheat Growers and SD Corn Utilization Council. The afternoon will include activities and demonstrations from 1:00-3:00pm on Greg Tople’s farm near Pierpont. Transportation will be provided. Activities will include a soil pit site, soil amendment plots and gypsum vs. lime analysis. There will also be demonstrations including soil stability tests, web soil surveys and instruction on several handheld soil measuring devices including electrical conductivity, pH meters, moisture probes and more. Click here to view the entire day’s agenda. Please pre-register if you plan on attending. There will be a charge of $10 per person collected at the workshop registration. This includes lunch, snacks and all activities. This entry was posted in Education, News and tagged corn, farm, saline, salinity, SDSU, sodic, soil, South Dakota State University.